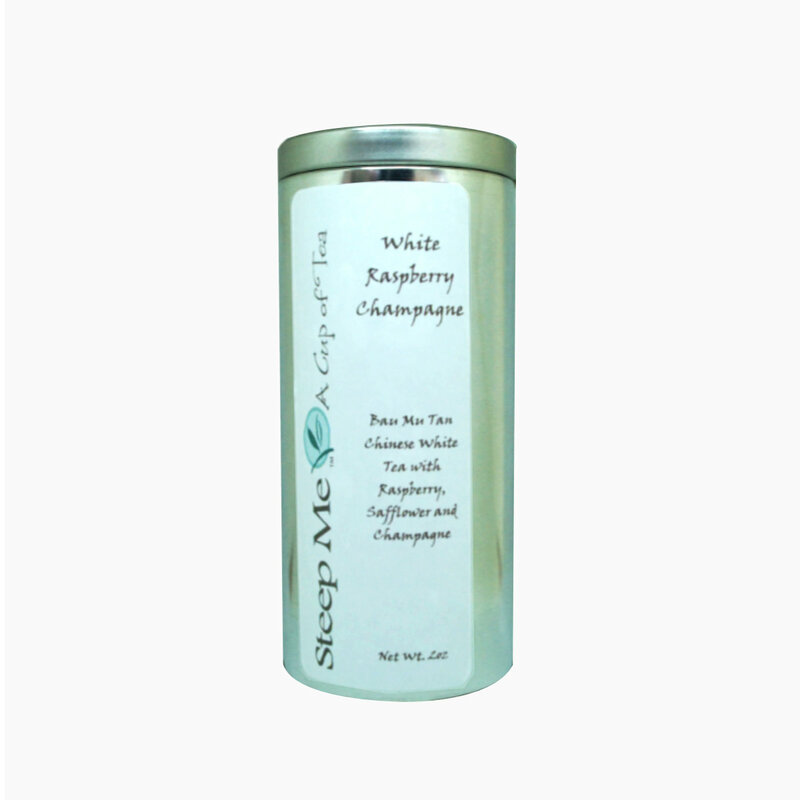 A great light and refreshing White Tea with Raspberry and the light taste of Champagne essential oil. This tea is good hot but when it is Iced it tastes just like the adult beverage. A great addition to your summertime menu at the lake or enjoying the outdoors. 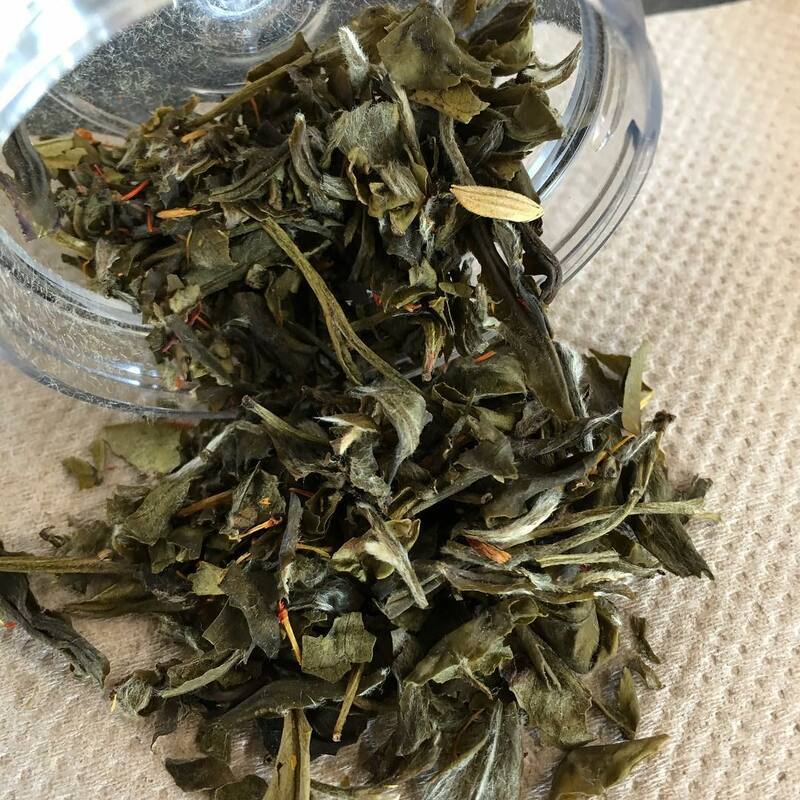 One of our most popular White Teas. We have combined Bau Mu Tan Chinese White Tea (Chinese White with 2 leaves) with Raspberry Pieces, Safflower and Champagne Essential Oils. It has great aromatics picking up the Raspberry Fruit and a slight tinge of Champagne. This tea has been made hot or cold and tastes great either way. Ingredients: Bau Mu Tan White Tea, Raspberry Pieces, Safflower and Champagne Essential Oil. When talking about the many types of tea, White tea is not as mainstream as the other types but has the most health benefits of the tea choices. It is a lightly processed (no rolling or roasting) tea leaf where it is mostly cleaned and dried and contains the most antioxidants of the tea family. White tea comes primarily from China but we also get a few of our stock supplies from Sri Lanka - especially or Silver Tips. White tea can take on two forms,,,,,The first is the tea bud (unopened tea leaves) where the exterior is covered in very fine and tiny hairs making it downy looking and a sign of good quality...The second is White Peony leaf or Pai Mu Tan or Bai Mu Dan which has green-gray colored first leaf and sometimes the second leaf with the bud of the plant making a very light colored and flavored cup of tea. Manufacturing of white tea is usually done in the following order according to our suppliers in China and Sri Lanka - Fresh tea leaf and bud (unopened tea leaf) is picked - then it will be withered or air dried. It is that simple...not much processing leaving it in its most natural form. This is our best selling Raspberry Green tea. With the addition of Blueberries and Hibiscus you are getting a full tasting blend of green tea. Try it! A great combination of Kiwi pieces and Pear pieces with a light white tea. Great hot or iced. This has been one of our best teas and its always fun to celebrate something that represents the USA! This tea is very light and refreshing and makes great iced tea. Nothing like a little Red, White and Blue! 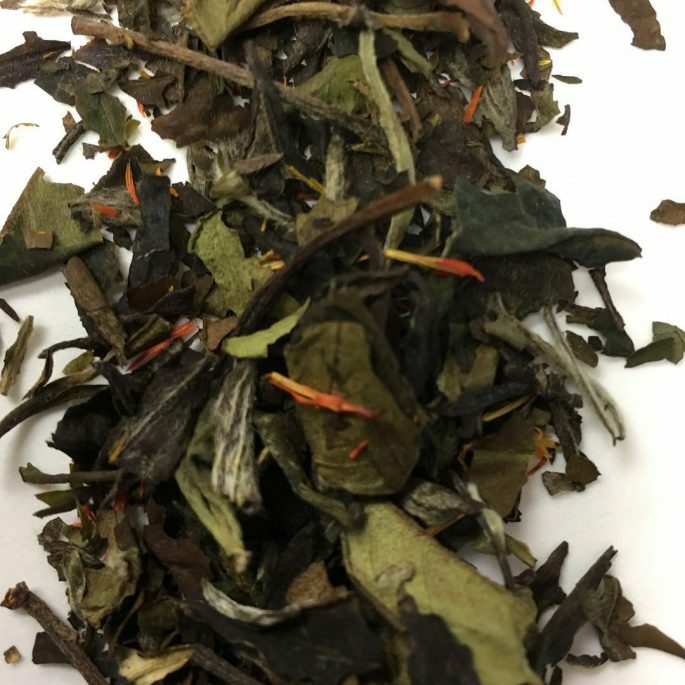 Very light and mild Organic White Tea from India. Great if you like simple tastes without anything overpowering the natural tea flavor!